Due to a lack of activity on our discord server, RCL will be moved to the forums. What is Reserve Clan League? It is a contest built for players who don't make the cut for Clan League, play a limited role in Clan League, or practice for newer and lesser skilled members. What do you mean by stage 2? RCL is built this season like the Qualifiers in clan league. With divisions of 4-5 in stage one where the top 2 advance to Division A a the bottom go to Division B.
I will be creating the games individually, similarly to Division C of Clan League. This will give me a better grasp on ho w the league is going, as well as speed it up. Games will be created for each tourney every 10 days. This quote on the C forum will also apply here. I will be doing things according to a schedule by individually creating the games, please be patient as I can only do this at times I am available, but I should be able to maintain the games well enough. As far as nonjoins, you may have more leniency on time to join the games. When I do check on your games though, if I see any games where a player has not joined (or has declined) within the three day limit it will be deleted and counted as a loss with one exception. If the player (or one of his teammates) is on vacation then I will not delete the game. This does not hold true if someone on the opposing team is on vacation. Is is your job to join the games on time, no exceptions. This league will use a qualifier group style format from clan league. 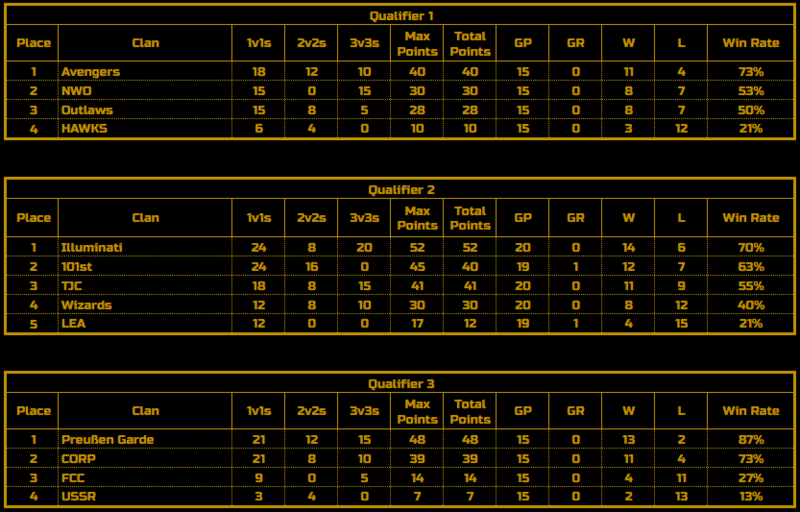 -There will be three qualifiers where the top two go to Division A and the bottom go to Division B. -To accommodate smaller clans the minimum slots allowed are bumped from 3 to 4. -Templates will be decided by clan leaders. -Rosters are expected to fielded by reserves or players that will play a limited role in Clan League. Feel free to use this league as a practice for Clan League, but do not fill your lineup with top talent. are you lacking our roster and if so where do you want it posted? Due to being on holiday (And then sorting the TJC-CORP merge I only just proposed my roster to TJC. I'll give them a day to give me input on whether they're ok with it and then submit it. Sorry for the delay !! The League is currently behind schedule and will not start for another few days. We've sent in our roster. Sent lineup by private mail to Cowboy. No response. He is on vacation now. Due to Cowboy's other commitments, I will be taking over control of game creation for Stage 2 of the RCL. I will try to get the games started as soon as possible. Thank you everyone for being patient.